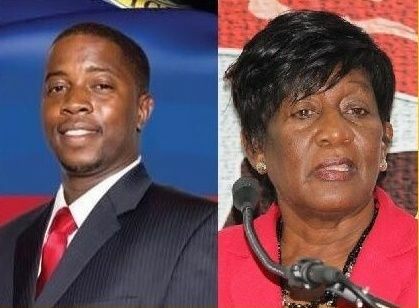 ROAD TOWN, Tortola, VI- Reports just reaching our newsroom from sources within the National Democratic Party (NDP) Administration is that Territorial At Large Member Hon Archibald C. Christian has been named the second Junior Minister. Virgin Islands News Online had first and accurately reported on November 6, 2015 that the NDP government of Dr The Hon D. Orlando Smith had named Eighth District Representative Hon Marlon A. Penn as one of two Junior Ministers but were undecided on the second as several names were put forward, including second term Representative Hon Christian, 5th District Representative and Deputy Speaker of the House of Assembly Hon Delores Christopher, and newcomer and Second District Representative Hon Melvin ‘Mitch’ Turnbull. However, while there was unanimous agreement within the ruling party for Hon Penn (R8) to serve as a Junior Minister, a debate was ongoing as to the final Junior Minister. It was previously reported by this news site that those supporting Hon Christopher had claimed that she is the most seasoned back bencher having been in office from 2003-2007 and then again in 2011 to current and that there needed to be some representation of women at higher levels in the male dominated NDP Government. This news site had reported also that Hon Christian was receiving the support of the NDP establishment, who appeared to prefer the At-Large system over the district system and seems to govern by giving preference to its At-Large Members, even though, according to the Virgin Islands Constitution both District Representatives and Territorial Members are equal Members of the HoA. According to the same NDP sources, Premier Dr The Hon D. Orlando Smith, who had the final decision on the appointment of the Junior Ministers, is expected to make the announcement of the two names this week. Following the request from the Government of the Virgin Islands to amend the Constitution to allow for the creation of two Junior Minister posts, the Governor conveyed a formal request to the appropriate authorities in the United Kingdom. “The Governor’s Office is pleased to announce that the Virgin Islands Constitution (Amendment) Order, 2015 (the ‘Order’) has been approved by the Privy Council. It has been laid before the United Kingdom Parliament and will come into force on 5 November, 2015,” stated a press release from the Governor’s Office on October 29, 2015. It further stated that consequently, from November 5, 2015 the Governor would be able to appoint, on the advice of the Premier, two Junior Ministers from among the elected members of the House of Assembly. The new Minsters will not be members of Cabinet, but will assist in the performance of Ministerial functions relating to economic development. The exact portfolios will be agreed on the recommendation of the Premier. @ where are the ladies: so that's we have so many "guys" over the past 5-years? Can the country afford this at this time? More power will go to this guyz head. LOOK AT THIS 5D YOU ALL WILL BE LEFT IN THE COLD ALL THE TIME TAKE THAT. Not a power gain but a responsibility increase. It will also be a scapegoat position used by the spin doctors of NDP people like MVW who always looking to blame anyone for his shortcomings but himself. The grocery store minister will use the person as a scapegoat also. If it were me, as a grown man, I wouldn't want to be a Junior anything it sound juvenile. Marlon has managed to keep his name clean up until now, let's see what happens now. what about that million dollar waste at georgie hill, yo forgot that? Congrats Archie C! You have been loyal to the party for along time so its time. I do not have anything against Hon Christian but I really think a woman should have been appointed to one of the positions. Hon Delores with her experience in government should have been the first choice and that would have brought balance to the whole situation. This is not just a man's world. What a pity! Experience in doing what? Give me a damn break. Being somewhere for 15 years doesn't make you better equipped for the job. Delores doesn't have the zeal to get anything done, let's be real here. No disrespect but wrong choice Hon. Premier. So tell me now our new representative got strike out again? like we in trouble from the get go. With all respect to the well wishers, personally I see this move to appoint "junior Ministers" as being ill advised and time will prove me right. If Dr. Smith feels over whelmed by his many areas of responsibility, he needs to examine the quality of the advice which he receives from his senior staff which includes the Ministry of Finance. At a time when students are being told to walk with their own toilet paper and merchants cannot be paid on account of a cash flow problem, we are taking on more and debt for no laudable reason. One of the two "junior ministers is already taking home two hundred and fifty thousand $250,000. a year. Will his earnings be further increased? That is the salary of the President of the USA. We need to wake up and smell the coffee. Where will the money. come from to pay the junior ministers?Millions of dollars was borrowed from social security under the guise of road works. To date one cannot see a decent or finished piece of road work. Some of the contractors seem not to have a clue of what they are doing. Mr. Primier please tell us what is going on. You are accountable to us. We seem to be behaving likeHaiti and other corrupt countries. Virginislanders do not have anyplace to run to. Are we being dragged into poverty after enjoying a very good lifestyle that drew others to our territory? You are so right! We are indeed being drawn into poverty and it is sad. The ship is sinking fast and there is no where to run. I'm glad for Archie. Here is where they Can be wrong or they can be right depends on their reasons to select Archie.. Maybe they know Archie is going to lose next election so they give him while he is there... Maybe they know Alvrera will win next election if NDP should win its easy to put Alvera in Archie position... Everyone live in peace..
NDP must go bottom line! look woman why yuh aint hush yuh corrupt deviant azz!!! could you please just go AWAY?